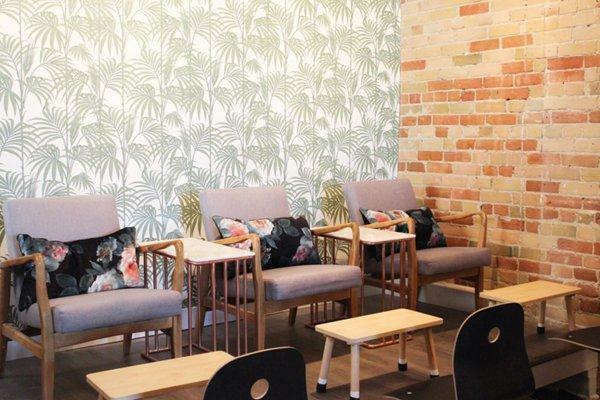 The service: A waterless pedicure ($55), at Barefoot Beauty, 643 Queen St. E.
The green factor: “A small salon like ours can save over 500 litres of water a day by eliminating soaks,” says Emily Stock, owner of Barefoot Beauty. “And then you’re not pumping loads of chemicals into our sewage system.” The charming natural nail salon brims with plants and vintage furniture while a rainbow of five-free polishes lines its shelves. Stock even whips up her own scrubs and lotions, using organic butters and essential oils. But for the registered chiropodist, going waterless wasn’t just about the environment. It was essential to prevent pathogens from proliferating and thus ensure high-risk clients like diabetics or chemotherapy patients could indulge in a pedi without worrying about infections. “It’s nice to have people with chronic conditions like that, who are under a lot of stress, come and be able to enjoy a simple luxury,” she says. The experience: I began my service with the very difficult task of choosing a colour. If you ever thought natural nail polishes didn’t rate as high as their traditional counterparts in the variety or trendiness categories, think again. I finally zeroed in on a spicy burnt orange and made my way to the cosy pedicure area at the back. Surrounded by exposed brick and palm-leaf wallpaper, I sunk into the chair as my toes were wrapped in a toasty towel and all hints of tension were massaged away. I’m talking a nice, long foot massage where you have time to close your eyes and take it all in. Calluses were buffed smooth and cuticles tidied up before my polish of choice was applied. When it was all done, I leaped onto Queen Street feeling pretty great about my snazzy new feet and their positive ecological footprint. And as for the million-dollar question: Did I miss the water? Not one bit. The green factor: Pure + Simple is Canada’s OG green spa. Wellness pioneers Jean Eng and her daughter Kristen Ma opened their doors more than a decade ago, when goop was just a twinkle in Gwyneth’s eye. Today, Pure + Simple has seven locations, which offer all-natural treatments beloved by local beauty editors for their efficacy and integrity, plus a curated selection of skin care brands (including their own), which are all free of parabens, petrochemicals and synthetic dyes. A bonus: Customers receive $1 house credit for each bottle they return — plastic bottles are recycled while ceramic containers are pressure-washed, sterilized on-site and reused. The experience: Fall is the season of pants, possibility and pumpkin spice everything — for me, it’s also the season of pimples. I headed to Pure + Simple with an inflamed ridge along my chin, zits clamouring to the surface like Ariel cresting in The Little Mermaid. My facialist, Theresa, who has the soothing mien of a favourite aunt, examined my skin and declared that I need hydration, stat: “The skin is dehydrated and producing a lot of excess oil.” Theresa got to work, using all Pure + Simple products: a gentle cleanser, the calming anti-inflammatory calendula toner and the detoxifying camellia oil paired with a heavenly facial massage. Next up: extractions and exfoliation with a Bio-Enzyme Peel — Theresa chose the pumpkin variety for maximum decongestion and, I imagine, fragrant seasonal flair. The treatment concluded with layers of moisture, including a sheet mask doused with the certified organic Collagen Elastin Serum. After a blast of refreshing oxygen, I left looking glowing and feeling slightly intoxicated with wellness. The service: Aveda Deep Hydrating Treatment ($25), and Blowout ($45), at Studio 67, 67 Portland St. The experience: I kicked back in the airy salon to enjoy a relaxing scalp massage and Aveda shampoo. My senior stylist Ruth had a deft touch, but I somehow resisted the urge to fall asleep. After the Aveda Dry Remedy Moisturizing Masque was applied to my hair and wrapped in a warm towel, I hung out at the spacious central marble dining table for 15 minutes with other eco-beauty-seekers while the Buriti and olive oils worked to replenish moisture and smooth frizz. Once the treatment was rinsed from my newly quenched hair (and after another scalp massage, hurrah!) I headed over to Ruth’s chair to get a sleek-yet-tousled Dyson-driven blowout that would last for days. The post-treatment shine could not be ignored.